Takeuchi Manufacturing designs and manufactures a range of glass products for a variety of applications including everything from tableware to optical lenses. 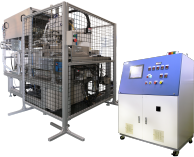 With help from our industry partners, we provide furnaces, molds, and a full range of other peripheral equipment essential for glass forming. Maintaining close consultation with the customer at every step of the process, we design and manufacture fully custom-made, purpose-built equipment. Mass production of high-precision optical glass elements in a vacuum. Forming system for precision glass optical elements.